The EasyIDea™ minilam™ 450T is the best value pouch laminator with Temperature Control available for ID cards! 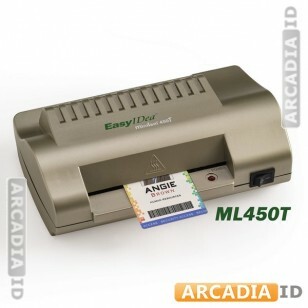 EasyIDea™ laminators are designed for the purpose of efficient ID card making. Unlike most pouch laminators on the market, the EasyIDea™ line is rated to handle the substantial thickness of standard ID cards. Most pouch laminators are only rated to laminate common 3-5 mil pouches used for laminating photos or documents. These common laminators may jam under the thickness of 7 or 10 mil pouches. They also do not have the heat necessary for lamination fusion. Because EasyIDea™ ID card laminators are specially designed for ID making, the rollers can accommodate up to 33 mil total thickness, giving ample space to safely handle 10 mil pouches. The internal heat setting is also set warmer, to the optimal temperature for thick butterfly pouch lamination. The max laminating width of the minilam™ 450T model is a generous 4.5". EasyIDea™ laminators also use higher quality rollers/components, eliminating the need for traditional paper carriers. Just place the laminate directly into the laminator and you're ready to go! The minilam 450-T is designed to laminate ID cards using up to 10 mil thick butterfly pouches with an optional temperature control. This temperature control lowers the laminating heat to a temperature suitable for 3-5 mil pouches, making the laminator usable for all laminating purposes including photos and documents! The minilam™ 450-T also has a cold lamination setting for use with adhesive laminating pouches. -Supports ID cards up to 4.5" wide. The EasyIDea™ minilam™ pouch laminators are the only ones on the market that are made specifically for ID card creation. Low-end pouch laminators (such as the GBC® HeatSeal™ H115) cannot handle the unique thickness and heat requirements required to make professional-looking ID badges. GBC® has encountered many safety and legal concerns with these HeatSeal™ pouch laminators, as they are known to overheat and cause electrical fires. It is highly- recommended that when making ID badges you use only ID card specific laminators. Do not be fooled by companies still trying to sell these GBC® HeatSeal™ laminators as a practical way to make ID cards! Many do not heat properly causing poor looking cards. GBC® has already recalled 35,000 units; all model numbers starting with H---. For more information on the GBC® HeatSeal™ pouch laminator recall, please view the report conducted by the U.S. Government's Consumer Product Safety Commission.